A six-speed gearbox, leather trim and 167bhp. Jeff Bailey revels in the hottest of the hot hatches. Remember the eighties? When greed was good, mobile phones were the size of house bricks and yuppies ruled the world? Everything but the car world that is - because Peugeot's trim little 205 GTi was king of the hot batches with a balance, nimbleness and an outright enjoyment factor that was off the scale. 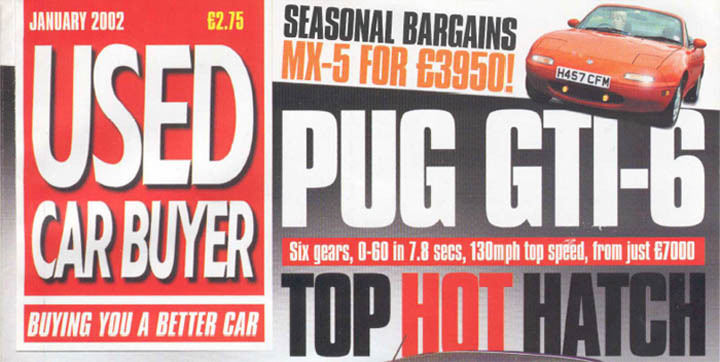 If the eighties symbolised excess, it was the little Pug that actually proved less was more. 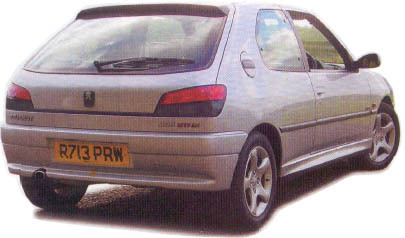 After crash regulations killed it off in 1992, there was nothing in Peugeot's range to fill the void. The diminutive 106 at that time had no GTi variant and in any case was a class smaller. The new 306 on the other hand was a class bigger. Not only that, the S16 twin-cam version was coarse and, bearing in mind the extra weight, the 155bhp it produced really didn't cut the mustard. Things looked grim for lovers of the seminal 205 GTi, until the 306 GTi-6 was launched in August 1996 to almost universal acclaim. Here was a car with a class-leading 167bhp - more than enough to dial up some real fireworks, giving a top speed of 130mph and a 0-60 of 7.8 seconds - the same as the 205 GTi 1.9, as it happens. On top of that, there's real top-drawer driver involvement via an exquisitely balanced chassis and a silky-smooth six-speed close ration box that always keeps the engine on the cam. The 16-valve 2.0-litre unit has a depth of flexibility, and yet smoothness to the 7250rpm red line that begs you to do it on every gear change. Not that that's a chore either, as the six-speeder is there more for pleasure than economy, it's ratios stacked closely so you're never off the cam. Whether running up or down the box, it's a joy. On the road, the engine lights up at about 3000 revs and really takes off after 4000. Using all the revs produces real pace in any situation, enabling you to steer and adjust your line on the throttle. This gives the well-sorted front drive chassis something to do, although it's never flustered and only in extremis will it oversteer - unlike it's 205 predecessor which could be unforgiving, particularly lifting off abruptly mid corner. The 306 just tucks in neatly when faced with the same situation and if anything feels neutral, but with just a hint of oversteer when the going gets tough. Rear-wheel drive thrills with front-wheel drive security and always a hoot whatever the occasion. Just try driving this car gently - you won't be able to. That's not to say it's only a B-road blaster. Motorway cruising is brisk and relaxed thanks to the tall sixth gear and the ride is very well damped for a car with such sporting intent, absorbing poor surfaces with aplomb. The only downside to this car's character on the road is the relatively heavy clutch and steering plus a surprisingly poor turning circle, which can make serious city driving feel like a workout at the gym. Introduced August 1996 with 167bhp, replacing the 155bhp S16. "Cyclone" alloys shod with 195/55 VR 15" tyres. Facelift April 1997 with new corporate front end similar to 406. Revised dash and instruments, bigger bumpers, remote audio controls. Air conditioning standard. 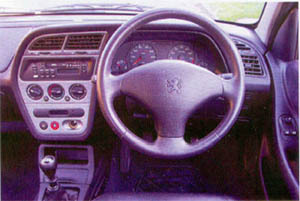 Further revision February 1998 includes remote central locking, split rear seats, side air bags, leather and alcantara trim and CD changer. New lights and aluminium dash from February 1999. Phased out in the middle of 2000. One of the great benefits of a hot hatch is the way they are usually based upon more mundane machinery from the same stable. This is especially true of the 306 GTi-6 as it has all the reliability of the rest of the 306 range coupled with ease of servicing because all major components, bar the six-speed box, are used elsewhere by Peugeot. A major service is ever 18,000 miles, taking 2.2 hours, and the oil service every 9000 taking 1.4. So the 306 is durable mechanically and there are few problems in normal use that are reported. You can expect to get through front tyres every 10,000 miles at up to �240 a pair, but this is a consequence of hard driving and 167bhp through the front wheels. On the other hand, brake pads can last for 30,000 miles. One strange problem reported by more than one Peugeot service manager is a curious body and exhaust vibration that only occurs when running through deep standing water in the form of puddles. Nobody knows why, but it does happen - however, there seems to be no harm done even so. All spares are very reasonably priced, with an exhaust costing only �192, a headlamp unit �74 and a front wing about the same. Running one of these day to day won't cost an arm and a leg ... until you come to the insurance. A Group 18 rating with most insurers means a second mortgage if you're under 25 and those over the magic age, but without a maximum no-claims bonus, will wince too. Put bluntly, Group 18 is higher than a 4.4-litre BMW 540i, so this needs to be investigated before you part with your hard-earned cash. Fuel economy, however, is a creditable 25mpg overall - so that shouldn't put a big dent in your wallet. One thing you won't get owning a 306 is unwanted attention. That's great if you want to avoid the gaze of the local constabulary, but not so good for the pub car park. Then there's the dull-as-dishwater dash - it all looks very sober and uninspiring, but driving this car you won't be looking at it very often anyway. Ultimately this is a car for drivers, not poseurs, and that's just the way we like it. Insurance broker Neil Inns bought his 98R GTi-6 at 22,000 miles in May 2000. As he works in the city, he doesn't cover a huge mileage and wanted something that could be enjoyed at weekend on the country lanes around his home in Stevenage. Not only that, he wanted something that wasn't going to attract too much attention in the station car park either. The 306 fitted the bill on both counts. Neil paid �11,500 privately, but the car is now worth about �9,250 at 28,000 miles. He doesn't care, as he has no plans to sell soon. "This is about the most fun I've had in any car," he says. "Quite frankly, if you're an enthusiast - as I am - you don't need more car than this on our crowded roads. Besides, I've shown many more powerful and costly cars my tailpipe on some of the lanes around here!" Asked if anything had gone wrong, Neil says, "Apart from some rather annoying squeaks and rattles inside, nothing has given any cause for concern. In the winter, she started first time and I've not had any electrical problems either"
One thing that does hurt is insurance. Even on the right side of 35 with a clean record and maximum bonus, the 306 is still costing him �715. "This is a car I couldn't have afforded when I was in my 20's," he says, "but now I wouldn't want anything else." By all accounts, the 306 GTi-6 is a hard car for main dealers to shift on right now. It's a discontinued model and the newer 307 has refocused their interest. As for the buying public, the high insurance cost seems to be taking its toll. In the latter stages of its life, very few GTi-6's were sold, so there aren't that many late ones about either. But all this means good news for the bargain hunter. Now, in the depths of winter, a performance hatch will be at its lowest level price wise, so it's a good time to strike a deal. Right, having established that buying one is a good thing, what do you look for? Build quality was always better than the old 205, but still a way short of the equivalent German opposition, so make sure you check for creaks, rattles and any evidence of hard use such as worn carpets, pedals or wheel - not to mention uneven tyre wear. Check for smoky engines, particularly on start up and on the overrun, and also for coolant leaks. The electric's have been known to cause trouble too - especially the windows, so make sure that they all work okay before signing on the line. Colour-wise, the range was fairly limited, so there are none to really avoid. The range was revised in 1997 and the post facelift is the one to go for, always assuming that your budget will permit. Remember also that, up to 1997, air conditioning was a �800 option when new, but it is much sought after on used examples - so seek those out. And finally, in view of the discontinued model status and the relatively high insurance rating, make sure that you haggle really hard, and then haggle some more. There are enough about for you to be choosy, but they are still relatively rare and, although we don't predict classic status anytime soon, the GTi-6 reputation for dynamic brilliance should keep the Pug from the crusher for some years to come, and will provide the driving enthusiast with probably the best hot-hatch drive at the price. "All this means good news for the bargain hunter. Now, in the depths of winter, a performance hatch will be at its lowest price, so it's a good time to strike a deal"